L is getting more and more interested in letters and we’re using our magnetic alphabet set to play some alphabet games. There are lots of ways you can use letters of course, depending on how old your children are, but here are two easy games to use with those just starting to recognise letters. Put a selection of letters on the fridge door (making sure they are all the right way up) and ask your child if they can hunt out the ones which are in their name. We’ve been writing L’s name on drawings, coat pegs, cards to send to friends and so on ever since she was tiny so she’s had lots of chance to get to know what her name looks like. I sound out the letters of her name as I write them and she has learned the sounds, order and shape of them pretty much just by observing this. A child’s name is a great place to start working with letters: they’re pretty ego-centric so they like it being all about them! We always use a capital first letter and lowercase for all the others (so I replicate this with the fridge magnets too). We put all the letters on the fridge and I select one and say ‘this is an ‘a” and ask L if she can make a match. Snap! She likes to take a turn choosing a letter for me to match – which lets me see how many letters she knows the sound for. 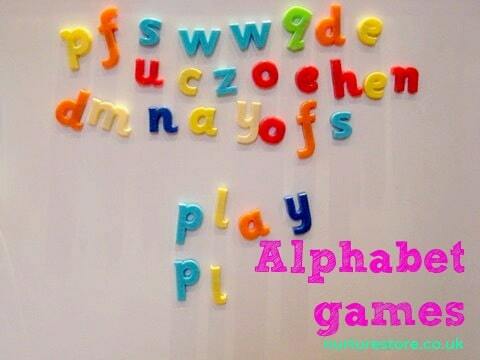 Have you got a set of magnetic letters on your fridge door? How do you play with yours? Previous article: Booktrust Booktime website and prize drawNext article: Does starting school mean the end of play? You could sort them by color or by letters that have curves and letters that don’t. Thanks Activity Mom – I shall go and visit We Teach. Oh my Cathy, what agreat post.I will FORCE my husbad to watch this. Th one “repeating” issue we have is his ., ahem, grumpiness in the car… I try and point out the kids to him…. nuff said. Hope your husband likes the video Maggy! Oh no posted the comment under wrong post! We never had these on the fridge, but we did have sets of alphabet letters we played with. It’s funny that I can’t really remember what we’d ask, even though it was probably only a year ago (probably just asking him phonic sounds mostly, then making a word and asking him if he can read it). My son is definitely into the quizzing thing, so he’d have liked your methods too. My son learned all of his letters without any direct instruction.. mostly I think because we read a lot and we have letters on our fridge. I want to start exposing him to the letters in his name next so thanks for the ideas!! That’s great Amandab – I think once they click on to letters they start spotting them everywhere. that’s a lovely set of letters.. can I ask where you got them? Love the playful learning happening here.